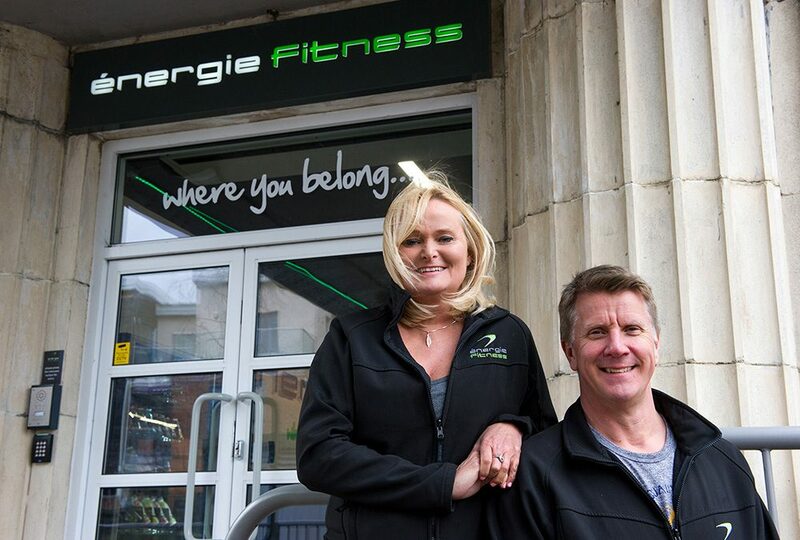 Husband and wife team Peter and Jo Gunter opened their first énergie club in Hoddesdon, Hertfordshire, in September 2015. Since then the pair have gone on to open their second club in Palmers Green, London, in 2017 and are looking to add more sites to their portfolio. What was your background prior to becoming an énergie franchisee? Jo: I was a secondary school teacher and loved teaching for the past 25 years. After having three children I asked myself what I wanted to do for the next 25 years. I felt like I needed a new challenge and a bit of excitement. Peter: I have been running my own plumbing and heating contracting business for the past 20 years. Prior to my career in plumbing and heating, I was a professional squash player and still represent England at master’s level. Where did your interest in opening a fitness franchise begin? Jo: We discussed something that we would like to do together, it seemed like life was dictated by being a teacher and only having the ability to take holidays at certain times. One of the great things about the énergie franchise is the flexibility. Initially, the hard work is in setting up your team but once you have that in place the flexibility that the business model offers is fabulous. Peter: Once we decided on the énergie franchise, the plan was always to scale down the plumbing and heating business, and as the gym business builds and takes off and we are on course to do that by the end of the year. The Palmers Green club is growing all the time and the Hoddesdon club is doing great! Why did you choose énergie? Peter: We were looking for inspiration and came across énergie at a Franchise Exhibition. After meeting the énergie team on the stand we attended one of énergie’s franchise Discovery Days. The opportunity ticked all the right boxes, the company was young enough that we could open a club in the areas where we wanted and the investment and returns looked good and in-line with some of the most established fast-food franchises. It all linked together perfectly. After attending the Discovery Day on my own, Jo attended a second Discovery Day with me. One of the key criteria was that we both had to agree that it was right opportunity and would work for our family. When did you open your énergie club? We opened Hoddesdon in September 2015 with 1,200 members and sold 232 memberships on our opening day, which at the time was a network record. Palmers Green opened in June 2017 and has been getting better month on month. How did you find the process and support from énergie as a new franchisee? Jo: Knowing nothing about opening a fitness club, the support from énergie on the opening of our first club in Hoddesdon was fantastic, especially during the pre-sales phase. The on-going support is strong and is there when you need it. Our Divisional Operations Manager Phil Hall carries out regular regional development meetings which are attended by our Club Managers. These are not only a great method for making the Club Managers accountable for their KPI’s but also for their own professional and personal development. énergie provides real opportunities for our teams to grow and central training programmes such as ‘Take the Stage’ enforce a real expectation of what our teams need to deliver on the ground. As such, our Club Managers are able to run the clubs themselves and can develop within énergie’s support framework. This has been one of the keys to us being able to achieve the level of flexibility that we have. It also frees up our time in terms of being able to focus on developing the business. There is a good balance of having the right support available but you are also trusted enough to know that you are managing and running your own business. What successes have you experienced in your franchising journey so far? Peter: The clubs’ performances have been a great success. In our first full year of trading at Hoddesdon we posted a £178k profit which was a massive success for us. In essence, Hoddesdon funded our second site and we’ll be very happy if Palmers Green performs just as well. Another success is taking on a building that was a dirty, old shell and then building it from scratch to become a successful business and fitness club which is incredibly rewarding. We’re proud of our staff and how we’ve collectively built a great atmosphere and a nice place to work. Jo: For me, success is about having flexibility in my life, if I want to take a week off when I want I can. This is something that simply wouldn’t have been possible in my old job as a teacher. Peter adds: One of the original criteria for starting the business was we could go away for 3 months and come back if we chose to. We went away on holiday one week after opening Hoddesdon and came back with more members! Jo: Another success is seeing our staff develop through the process, we have had a team member start as a crew member, then move into pre-sales and is now managing one of our clubs. This is another example of how énergie’s support framework allows team members to develop through the leadership apprenticeship programme. The member success stories are also incredibly motivating, seeing members lose weight and achieve their fitness goals in our clubs is what we’re all here for. What words of wisdom would you give to a franchisee who was starting out? Jo: Remember that nobody is going to look after the business the way you would, you need to be an active franchisee. We have found that this approach has worked best for us, however every franchisee is different and it’s a case of finding out what works best for you. It’s also important to understand that your team are your greatest asset, staff selection is one of the biggest parts of our success. Out of our current Hoddesdon team, 6 of the team are still with us since our pre-sale in September 2015, which is fantastic and undoubtedly a key contributing factor to our success. Would you open more énergie clubs in the future? Peter: Yes, at the right time and it would have to be in the right location. For our 3rd and 4th sites we have the opportunity to be very selective about the sites we add to our portfolio. What does it mean to be part of the énergie family? Peter: énergie has an ethos of wanting you to do well and wanting to do well in business overall. Everyone from the central team and throughout the network wants everyone to do well. This is important for the brand and there is a real sense of collective success. Jo: There is a supportive network that includes the énergie Central Team, other franchisees and suppliers. Running your own business with this support feels very professional and feeds down to the staff in our clubs. Want to find out whether a gym franchise could help you achieve the work-life balance you’ve always dreamed of? Get in touch by filling in your details below.